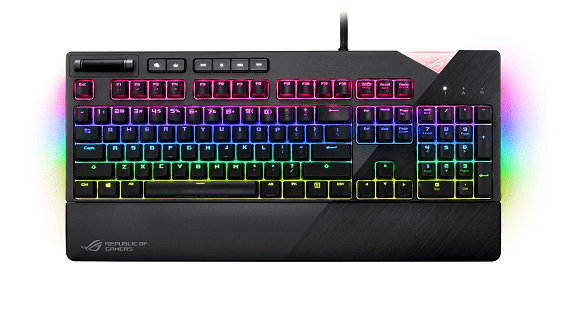 The new ROG Strix Flare mechanical gaming keyboard features Cherry MX RGB switches, customizable illuminated badge, and dedicated media controls for gamers. Today, ASUS Republic of Gamers (ROG) announced the new ROG Strix Flare which is now available in selected markets. This device is a versatile RGB mechanical gaming keyboard that improves upon a well-established formula of exceptional performance and unrivaled personalization features. ROG Strix Flare is currently offered with four different Cherry MX RGB switch types — red, blue, brown, and black — to deliver the precise mechanical feel and responsiveness demanded by gamers. The keyboard also features 100% anti-ghosting technology with N-key rollover to ensure all keystrokes are registered reliably, no matter how many keys are pressed simultaneously. 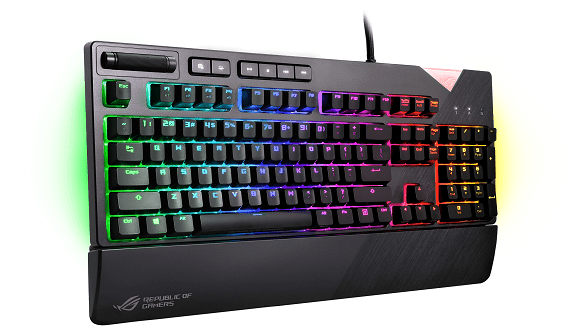 ROG Strix Flare lets gamers experience a new level of personalization with a customizable illuminated badge that can be inserted directly into the keyboard. Gamers can keep the pre-installed ROG logo badge or design their own insignia on the provided blank insert and see it flare up with Aura RGB lighting. The badge can be easily customized using paint or printed stickers. Gamers may also seek professional printing or laser etching for a premium touch. Individually backlit keys are housed in a dual-textured case displaying the signature ROG slash design, and a row of LED sunder both sides of the case which creates a vibrant under glow that extends the customizable lighting beyond the keyboard. Powered by Aura Sync, ROG Strix Flare puts the entire color spectrum and a range of dynamic lighting effects at gamers’ command, enabling them to create a unique color scheme. All onboard lighting can be synchronized with the extensive portfolio of Aura Sync-enabled devices for a truly immersive gaming environment. 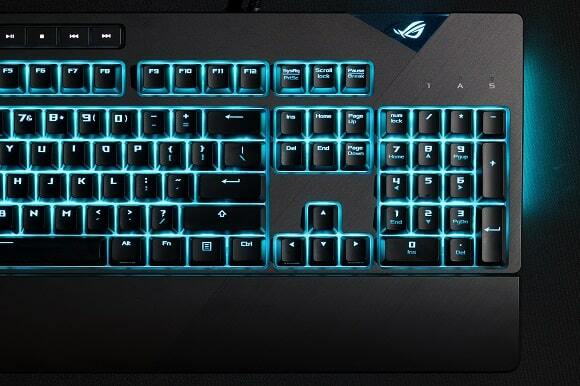 While most gaming keyboards place media controls on the upper-right, the ROG Strix Flare features its dedicated media keys and a smooth-scrolling volume wheel positioned on the upper left. This gives gamers instant access with their keyboard hand, eliminating the need to take their finger off the trigger to make adjustments on mid-game. The keyboard also features a handy USB passthrough port for conveniently connecting other devices, as well as a detachable soft-touch wrist rest for extra comfort. The ROG Strix Flare comes with ROG Armoury II, an enhanced, driver-based version of ROG’s peripheral configuration utility that offers improved controls while using less system resources. ROG Armoury II enables gamers to create profiles, customize colors and lighting effects, map keys, record macros, and even track hardware stats during gameplay for data analysis. The new ROG Strix Flare is available for ₱9,410 in PC stores nationwide.